We took our seats, right on the glass, as the first puck was dropped for the match between the Blackhawks of Chicago and the Montreal Canadians. Mark Ungashick and I had driven up to the big city, from South Bend, on a frigid midwestern night in my Volkswagen with no heater and two sleeping bags. Our pockets were full of beer and yogurt, borrowed from the dormitory food sales that Unge ran when he wasn't chasing girls or bombing out of engineering with me. But that was school and this was the NHL, so we settled in to our seats for some ballet on ice and some ultra-violence. The Blackhacks were mediocre, as usual, but Tony Esposito was the hot goalie of the NHL that year. 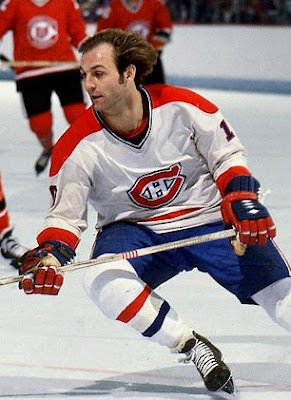 Les Habs had dominated three straight Stanley Cups with the line of Lafleur, Shut and Mahovlich and were having trouble getting motivated for easy games as of late. Chicago Stadium was a bright hazy buzz of anticipation, painted thick bright red from an infinite number of hockey games. The tickets were a gift from a roommates father who ran some sort of meat packing business that required him to have front row seats for the Bulls and the Black Hawks. The pace was unbelievably fast and furious, especially from our vantage point where pucks caromed off the glass and players faces were being smushed, right before our eyes. Then it happened, in slow motion - the magic, the move, the moment. Guy Lafleur took a clearing pass in full stride deep in the Blackhawk zone as he cut from his wing towards center ice. The crowd rose with the "Flower" - as the MVP scoring champ of the early seventies was called by the press. He wheeled effortlessly across the fire line dealing the puck from side to side with his long, wooden stick. It was the days before everyone needed helmets and Guy's long, straight hair billowed freely behind him as he accelerated. Two Chicago defensemen chased after him, thwacking his arms and hands with their sticks, annoying but not deterring. As he passed the blue line he was flying at more than 30 miles per hour, bearing down on Esposito who had come out of the net for the classic confrontation. Just as Lafleur passed in front of us he shifted sideways, dug his blades into the ice, and stopped dead. He did not stop with a slide, nor on a dime, he stopped instantaneously, defying physics and fate. His hair flowed in orderly slow motion, like seaweed in the ocean currents, from behind his head, past his ears and eyes, until it swept in front of his face and hung there expectantly. The defensemen suffered the same inertia, stumbling past Guy and colliding in front of him, screening Esposito's view of the puck and of the Flower. With a flick of his wrist, La Fleur shot the puck over the goalies glove side shoulder, top shelf, launching Esposito's water bottle in the air and lighting the red goal lamp. We howled. The home crowded exploded and both benches erupted in appreciation at the display of pure athleticisim. The hapless Chicago defensemen were stacked and tangled in their own net along with the Tony Esposito and the puck. I looked at Unge incredulously. His mouth was wide open and his eyes, I swear, were popping out of his head, even more than usual. We fell all over each other with high fives and bear hugs, banging the glass and kicking the boards. La Fleur skated slowly off in front of us, with his lips pursed in a classic French Canadian look of ennui. I could still see La Fleur at the post game T.V. interview, smoking a cigerette (Camel, no filter - two packs per day), saying that it was just another goal and a good win for the team. We had never seen such style, such speed, such grace and will never forget, The Flower.